Acute exacerbations of chronic bronchitis is a disease that occurs in patients who suffer from chronic underlying airway disease, typically related to tobacco smoking. It does not commonly occur among healthy children or adults. Experts believe that infections are the most common triggers of acute exacerbations of chronic bronchitis episodes (50-80%), while inhaled allergens or pollutants trigger approximately 20% of episodes. 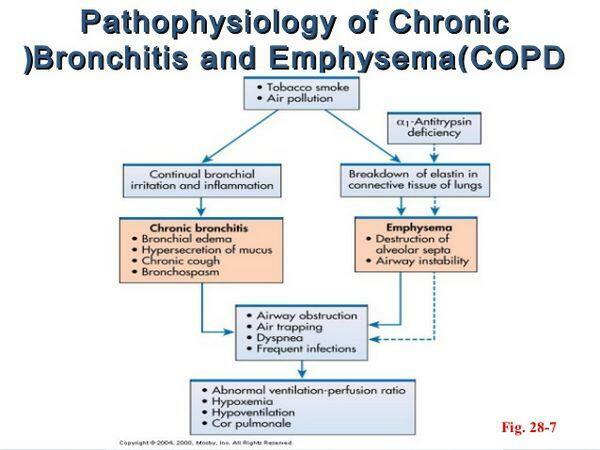 A critical factor in understanding the etiology of acute exacerbations of chronic bronchitis is the underlying lung disease; therefore, a discussion of chronic airway disease leading to acute exacerbations of chronic bronchitis is warranted. Are the bacteria recovered during exacerbations normal inhabitants (commensals) of the lower respiratory tract that contaminate the sputa, or do they truly cause the exacerbation? If the bacteria are responsible for the acute exacerbation, how do they adversely affect lung function during the exacerbation and beyond? Evidence now exists to support the role of bacteria in acute exacerbations. First, bacteria can be recovered from the lower respiratory tract not only from sputum samples but also from lower respiratory tract samples obtained using fiberoptic bronchoscopy with a protected specimen brush (PSB). Sampling the lower respiratory tract using this method avoids contaminating the sample with any upper respiratory secretions that may harbor commensal organisms. The potential for contamination by commensal organisms remains the chief factor limiting the reliability of sputum samples. The presence of an immune response, identified by the appropriate increase in serum antibodies to bacteria isolated from patients with an exacerbation, further supports the role of bacteria in the pathophysiology of the disease. Studies testing for antibodies against homologous infecting strains have demonstrated that serum collected from patients following an exacerbation contain neutralizing, bactericidal activity against the homologous infecting strain; this activity was absent in serum collected before the exacerbation. These studies avoid the shortcomings of earlier studies by using immunoassays that are specific to antibodies of surface-exposed epitopes (specific sites on the bacterial antigen), rather than measuring antibody levels to whole bacteria. Additional evidence of the role bacteria play in acute exacerbations of chronic bronchitis comes from a number of placebo-controlled studies examining the role of antibiotic treatment in acute exacerbations of chronic bronchitis; these studies demonstrate an overall clinical benefit to patients treated with antibiotics. Typically, antibiotic treatment results in a shorter exacerbation, a more rapid return of peak flow rate, and high overall clinical improvement. Antibiotics may also increase the interval between exacerbations, decrease hospitalization, and prevent the development of secondary bacterial infections or progression to pneumonia. Patients who derive the greatest benefit from antibiotic therapy are those with more severe functional impairment and a higher number of exacerbations per year. Increased presence of bacteria (bacterial load) is strongly associated with the severity of an acute exacerbation, yet the type of bacteria involved also influences the severity of airway inflammation. For example, investigators have demonstrated that exacerbations involving P. aeruginosa are associated with more inflammation than those involving H. influenzae. In contrast, M. catarrhalis and H. influenzae are associated with a similar degree of inflammation, provided the bacterial loads are similar. Researchers are working to determine why different bacteria cause varying degrees of inflammation. This information might help elucidate the pathogenesis of specific infections and thus identify drug-specific targets unique to these pathogens. Causes other than bacterial infection can also precipitate an acute exacerbation, including viral infection, exposure to inhaled toxic substances, and allergies. The common belief is that infection or other triggers, and the consequent inflammatory response elicited in the bronchi, lead to increased airway obstruction. Viruses (including rhinoviruses, respiratory syncytial virus, influenza, parainfluenza, and coronavirus) may be involved in up to one-third of acute exacerbations of chronic bronchitis episodes. Although patients with acute exacerbations of chronic obstructive pulmonary disease do not seem to have increased susceptibility to these viruses, they face more serious consequences, such as more severe and frequent exacerbations and secondary bacterial infections. Researchers propose that during a viral infection of the lower respiratory tract, mucociliary clearance is impaired because of loss of ciliated cells and altered mucus flow. Viral infection also increases epithelial permeability, via inflammatory mediator proteins such as kinins, which escalates the inflammatory process already ongoing in the chronic bronchitic lung. These changes facilitate subsequent bacterial infection or an increase in the number of bacteria that are already colonizing the lower airways. Although the viral infection may be self-limiting, the secondary bacterial infection can perpetuate the exacerbation. Evidence is also emerging that viruses may enhance the inflammatory response to subsequent infection by activating transcription factors. Transcription factors bind to specific consensus sites on DNA and act to regulate (increase or decrease) the rate of transcription of a specific gene. Transcription-factor-mediated enhancement of infection and inflammation is a heated area of research in infectious diseases.